This wonderful documentary examines how a well established farm that has survived several generations must go back in time to restore and enhance some of the more traditional methods of farming in order to survive the demands of the future. What I found most striking was the comparison in past pictures of the field’s vast biology to recent times as a result of years of plowing up the soil. The pole barn construction continues! The clear and vented ridge went in thus completing roof construction. Just to make certain I hadn’t really goofed on a few dimensions, our son and I put the sliding door together. While the boys were finishing up that chore, my great and talented wife cut and hung the remaining wall girts. To my relief, the sliding door matched up exactly how it was supposed to. Before putting up the walls, it was time for lunch and a nap for some. We installed the J-Channel trim at the eave and measured the proper distance to allow 1/4″ below the bottom of the wall panels and installed the base trim. The placement and alignment of the first wall panel is crucial. If it is set at any angle other than true plumb, the entire wall will head either uphill or downhill. With great care we set the first panel in position and hoped for the best. Once the second and third panels were installed, it was wonderful to see the constant level line of steel along both the top and bottom of the panels. Shorter days and cabin fever often combine together as a recipe for the winter blues. A time when energy, motivation and happiness can be difficult to produce. Add to that mix a daily dose or two of the unending stream of bad news strumming across the television or internet and one can feel left grasping for anything worth hoping for. Our minds can wander all too quickly to digest upon all the negativity that surrounds us and our outlook of life and humanity will sink to ever new lows. Is there really any hope? Can things really be this bad? Yes, there are plenty of negative, horrible circumstances and events taking place at this very moment. On the other hand, there are also some absolutely wonderful and beautiful things happening too. While there is no end to the former on the typical news and media outlets, the latter is very much under reported. We can surmise as to the reasons for this unbalanced approach to reporting, but in the end it is what it is. Is there anything that can be done about it? Sure, but it may take a little extra of that hard earned energy to find it. Once you do however, it may just be a surprise to discover the blanket of winter blues has fallen to the floor and the warm rays of sunshine are falling on your face. If you feed only (or mostly) on the negativity this world has to offer, your heart, mind and soul will soak it in until those inputs become the output of your own life. When instead you feed upon the positive things, your heart, mind and soul will reap the healthy benefits of happiness, contentment and joy. Finding such encouragement and inspiration is a high-risk gamble if you are looking to most main-stream media outlets. Instead, you have to do a little more searching around to find what your mind is seeking. Here are a few sites that I enjoy visiting and I hope you too will find encouragement there. This world is and has been chock-full of violence and mayhem since the fall of man, but God has remained steadfast and at work this many millennia. His grace, mercy and love are not that hard to find if you really want to see it. Aside from developing a regular habit of trading bad news for good, consider turning off the television one or more evenings a week and sit down with a good book. It may be a daunting challenge to find a really good book that is worth your hard-earned money, but they are out there. Ask your friends, colleagues, librarians and so on what books of an inspirational nature they’ve read or heard about. You can also visit our WhirldWorks eStore as we will continually seek out good sources of positivity. Remember that while bad things are happening around us, bad things have always been around; but also that good things happen every single day and God smiles upon those that seek to rise above the fray. We decided to start 2015 off on the right foot and have already begun our transition to life on the farm. The first order of business is to put up a 20×20 barn for storage and eventual housing of livestock. I spent many hours in December trying to figure out what type of structure to build, and decided a pole barn was the right choice for us. I’m no construction engineer or designer and after several attempts to decide for myself what I needed to buy, the decision was made to order a building kit from Hansen Pole Buildings. Their staff was friendly and helpful in guiding us to the right choice of style and materials. Stuck before the work begins! I drove through the gate and made it about 100 feet onto the property when suddenly my truck sank into the rain saturated mud. I tried to dig it out and put blocks under the tires, but everything I did seemed to make the situation even worse. I ended up swallowing my pride and paid a tow service to come out and winch my truck to safety. I had set up the batter boards on a previous weekend, so all I had to do was verify that everything was still square and I began digging the holes for the 4×6 columns. The hand auger, which is a dream to use in dry conditions, struggled more than I expected in the saturated earth. I could get down about 2 feet quite easily, but when I hit the wet clay layer, it became much more difficult. Because my hand auger only cuts a 7 inch hole, I had to widen each one by ten inches with a shovel after the depth was reached. This process was only supposed to take a little more than half the day, but it pretty much consumed the entire 39 degree day. I’m thankful for the cooler weather because those holes gave me a workout! Once all the holes were dug, I filled them 6 inches deep with hand-mixed concrete. There were a few work delays throughout the day as trucks began to arrive with our building supplies. All but the steel shipment arrived on time, but more on that later. Welcomed by another cold morning, I set to work setting the column posts in position. It was no easy task as each pole weighed around 100 pounds. Getting them upright, plumb and level was a chore that took the entire day. Our dog enjoyed watching me struggle all day and as much as I wanted his help, he was content to roll around in the grass and look at me. The morning was spent pouring concrete into the holes and making sure everything remained plumb. Because my truck had sunk in the mud on the first day, I had to unload it half way between the gate and the barn. I had planned to use our garden tractor to truck the concrete to the barn, but was hit with another setback…flat tires on the tractor. This meant loading an 80 pound bag of cement into the wheelbarrow and carting it to the barn, then mixing it there. I did this over a dozen times that day and was glad when it was over. The poles were set just before the sun began to sink below the horizon. I had really had enough sleeping in the cold, so I went home for the night to kiss my wife and youngest son…after a hot shower of course! I recruited our oldest son to come out with me and we got right to work putting soil back into the holes over the concrete and tamping it down. The next step was to get the skirting boards on straight, level and even. With my primitive set of tools this proved near impossible. I ended up buying a laser level and it helped tremendously in getting the boards to come out right. Following that it was time to notch the columns so we could install the trusses. Now, back to that late steel delivery…I had lined up several friends for Monday or Tuesday to help me unload nearly a ton of steel, but the truck never came. It was on day five that I got a call the truck would be there about 2:30pm. I called all my friends and they had gotten busy over the course of the week and couldn’t make it out. Here I was at 2:15 and only me and my son to unload all that metal. My anxiety was getting pretty high…then…my son said, “Look, a tractor.” I told him it was quite normal to see a tractor come down our road now and then. But then he said, “Why is he trying to get into our gate?” I turned and saw a local farmer who a month previously I had struck a deal with to mow down our pasture so he could grow hay on our land. He just happened to show up 15 minutes before the steel arrived driving a tractor with forklifts! God is good, ALL THE TIME! On day six, I had two wonderful friends come out to help with the trusses as I knew this was not a job I could tackle alone. Thankfully one of them has a great deal of construction background and he was instrumental in figuring out how to get those 20 foot wide, 3 foot tall trusses into the skinny notches 9 feet in the air. We got all of them into place and braced everything off for the night. The sun shined down upon us as we spent the day installing the roof purlins. It was here I discovered a grand error on my part. Mainly due to the fact that I do not come from a construction background and am not used to reading drawings, I realized that the end trusses were level with the center truss. This was a big mistake as the purlins were supposed to install flush with the top of the center truss and extend over the end trusses for a 12 inch overhang. My mental gears began to grind trying to figure a way out of this mess. Finally I decided I would just install the purlins from truss to truss and then build out the 12 inch overhang on the external side of the end trusses. It will remain to be seen how well this does or does not work, but it was the only solution I could come up with. I doubt anything could go wrong though as our youngest son was a great supervisor. He even picked up a tool or two to help. While I installed all the purlins, my wonderful wife cut and fit the first half of the side girts. At the end of the day it was time to clean up and return to the real world. We’ll be back to finish it up soon! As November began to draw to a close, I realized I had not yet decided what sort of wooden toy I was going to make for our youngest son as his Christmas present. In the world of wooden toys there is an inexhaustible list of possibilities. Then we found out that a very generous family member had offered to give us a set of wooden tracks from their child’s Thomas the Train set. Because we are trying with all due diligence not to fill our home with iconic characters and toys, we would need trains for the tracks. I had my answer, he was going to get a wooden toy train! I wasn’t sure at first just how to go about this project, but then I found plans for just this sort of train here at the AOK Corral. The information on this site was exactly what I needed, but I thought it would be of added benefit to see if anyone else had built such a train. What I discovered was an entire hobby of various people experimenting and successfully building all manner of wooden trains that work on these popular tracks. 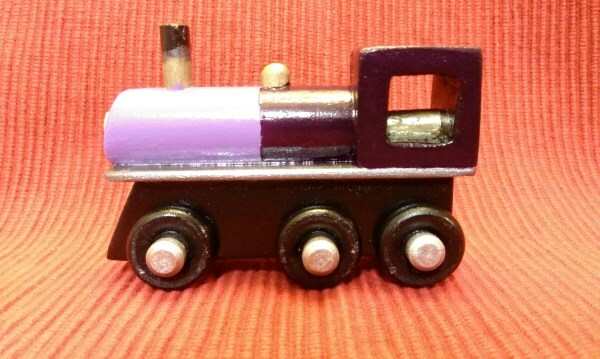 Once I found a number of sites, Evan Stephens blog on wooden trains became my got resource as he lays out his designs and links to many others as well. 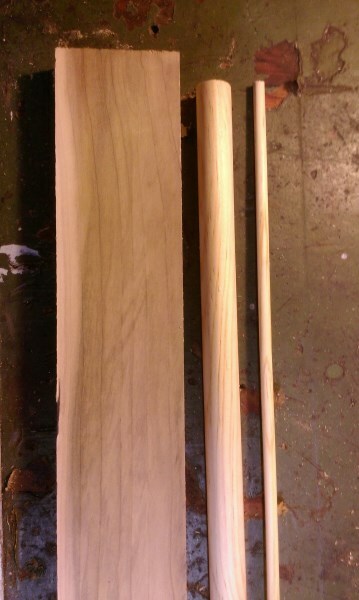 I started with some very basic lumber: a 1x6x8 piece of poplar, a 3/4″ pine dowel and a 1/4″ dowel. I decided I would make an engine, coal car, two freight cars and a caboose and set out to cut the lumber to the appropriate sizes. 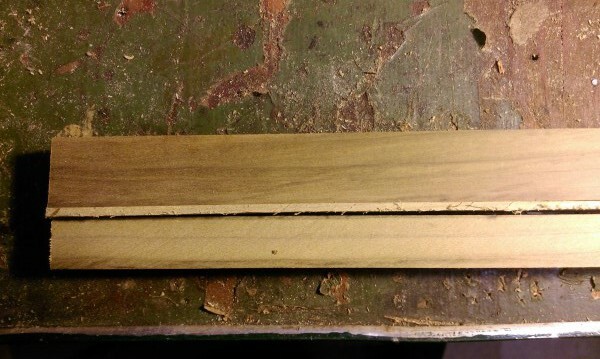 The most difficult cut was to get a clean length of 1/4″ thick board, but witha little bit of thought and preparation I succeeded in making the cut. Once I had the shapes cut out, I laid the engine pieces together and was very happy with how it came together. Getting the axle holes drilled properly with the set of tools at my disposal was a bit tricky, but I created a system that was accurate and was easy to duplicate. I set a wooden fend on the base of my Dremel, drilled the holes and then bored them out with a larger bit by hand. The longest phase, to my surprise, has been the painting. I don’t have a lot of spare time for working on this project, but found it necessary to apply the acrylic paint in several watered-down coats so as to reduce the possibility of brush stroke marks. I followed up the painting with several coats of clear Shellac. Although it took longer that I had originally planned, I am very pleased with the result. To say that not much has happened on the WhirldWorks Farm in 2014 can be quite misleading. In fact, at the beginning of 2014, the farm was just an idea. It was something we had put a lot of thought and research into, but in January it was just some words and numbers written on a piece of paper or bouncing around inside our heads. January and February quickly passed us by, but in March we had found and purchased the land that is and is yet to be WhirldWorks Farm. We have spent many ours enjoying the exploration of our new property and imagining what we can do with it. We established a sort of base camp on the property from where we can enjoy the time we get to spend on it and can honestly say that each time we get to do so, it is harder and harder to pack up for home. The next goal we met was to clear a path along the perimeter fence line. Without any power tools it was quite a bit of work, but it was oddly enjoyable to see progress even with only a brush axe and pruning saw. Another fun project was to install a front gate on the property. We did this during the summer and it too was a lot of fun, hard work. We cut down a Cedar tree with a newly acquired chainsaw, divided it into posts and removed the bark with a draw knife. We sunk the poles three feet in the ground and drilled the holes for the mounting hardware with an old bit-brace I inherited from my dad. The new gate looks and works great! Without water or electricity we made the difficult decision to not visit the farm over the rest of the summer months and can say that that was very hard for us. As the weather began to turn though, we headed back out and performed a little experiment with cutting and baling hay by hand. This was yet another example of some very hard work which felt fun and rewarding. We were indeed able to cut and bale some hay by hand and now we know more about the process. This is where we find ourselves now at the end of 2014. 2015 looks to be a VERY exciting year on the WhirldWorks Farm! We have ordered the materials for a 20×20 pole barn and have submitted our house plans to several builders for their consideration and bids. We certainly cannot say with certainty that all of these things will come to pass in 2015, but they are our hopes and prayers. Thank you to everyone who has been watching our progress and it is our greatest hope that we will have much more to share with you in the coming year! Our goal has always been, and probably will be for quite some time, to operate the farm as frugally as possible. Without a big purse available for purchasing things such as tractors, implements and the like, our intent is to look to the past for solving today’s challenges. One item we know we will need on the farm is fresh hay, cut and baled from our own field. Without fancy contraptions such as sickle or disc cutters and tractors, the natural solution is a hand powered solution. A suitable degree of research online yielded two devices that appealed to us. These are a hand-held scythe and a home built hand baler. There are surprisingly numerous options available, even today. Choosing a particular style of scythe wasn’t easy but the choices were narrowed to either the American Scythe or the European Scythe. Ergonomically, the European Scythe appears to have the advantage between the two, but weight was also a huge consideration. Knowing that I am not in the physical prowess of a full-time homesteader, I believed the most important factor was to find the lightest weight, yet best rated scythe out there, that we could afford. Through my research I settled on an American Scythe composed of the Seymour SN-9 Aluminum Snath and the Seymour 2B-42G30 30 ” Grass Scythe Blade . Combined, these two items are about 9 pounds lighter than their traditional wooden counterparts. While on the farm and just after a hearty breakfast, I headed out to a section of our pasture that had the most consistent area of good, tall grass and set to work. Let me say that the YouTube videos out there that show people using a scythe make this look deceivingly simple. Either that or our grass is much stronger than the grass harvested in those videos. I will also attest that the sharper the blade, the easier the task. I currently do not have a nice wet stone grinder to sharpen my blade and thus had to rely on the hand-held scythe stone. The more attuned I became to the simple nuances of the stone and blade, the sharper it became and the easier it cut. Still, once I had cut about a 50×50 foot area of grass, I was done for the day. We spread the hay out to dry for several hours, then began piling it up for the next stage in the process. Choosing a hand baling method was another interesting research project, but in the end I settled on building a version of the Pine Straw Hand Baler. This version appeared to be the prominent choice of the numerous hand baling videos and discussions I found. It also helped that the website that describes this baler included a link to plans on how to build it. I downloaded those plans and coming from a background working with engineers and designers, what they provide as plans aren’t necessarily just that. They include a picture of the baler and an incomplete list of materials needed. Because this was to be a prototype of what is to come, provided the trial was a success, I opted to use materials I already had on hand, which included a few sheets of OSB planking. I wholeheartedly do not recommend building a hand baler from the particular parts I chose, especially if longevity is the goal, but the materials I had helped me decide how to better build a later design I have in mind. Overall, the hand baler worked like a charm with a few caveats that have been noted for version 2.0. We piled in the hay (even our 2 year old got in on that action), compressed it with the plunger and tied it off. The very first try yielded what actually looked like a bale of hay! It wasn’t as compact as I thought it should be though, so for the next bale we added even more hay. I was concerned that perhaps the plunger might not hold up under that amount of pressure, but in the end there was actually room for more, should we so decide later. Long before you ever “pull the trigger” on selling your home, there are some very important steps to consider. Motivation is at the top of the list. If you don’t know why you want to sell your house or set expectations for its sale, the stage for failure is already set. Once you have clearly outlined your reasons for selling the home as well as the goals you have set for after the sale you can begin working through the following list. Home Inspection: Whether you hire an outside professional or perform the household inspection yourself is up to you. A certified, licensed inspector is likely going to find things you would have never thought of and going this route has its pro’s and con’s. On the positive side, you will have a much better idea what it is going to take to get your house into prime selling condition. On the downside, once you have a home inspection done by a professional, chances are you will need to disclose those results to any future buyer. If you don’t plan to remedy certain items on the inspection it can create a situation in which the buyer(s) want to negotiate a lower selling price or not submit a bid at all. At any rate, a thorough observation of your home is warranted and it is in the seller’s best interest to present the best home possible to the market. Repairs: If you have lived in your home for any length of time you know there are areas that need more attention than you have been able to provide. These can range from something as simple as cracked light switch covers to more substantial repairs such as cracks in sheet rock or foundations. The handier you are, the more of these repairs you can choose to do yourself which will definitely save money. On the other hand, professional repairs are often much more reliable and appealing to the eye. The homeowner must weigh the cost/benefit of which repairs to complete and then choosing who does the repairs. Cleanliness: Common sense should prevail here. A clean, odor free home is going to sell much better than a cluttered, smelly mess. From the day the house is put on the market to the day of closing, make sure to keep the home in as clean a state as possible. Ask for opinions: Once you have accomplished the above listed items, invite a few people you trust to come over to look over your home. They may point out things you had not originally considered. Take note of their comments and thank them for their input. You can decide later if you want to address the issues they brought up. Hire a Realtor: We have all seen “For Sale by Owner” signs in yards, but this is not a recommended practice. Yes, realtors can wield some pretty hefty commissions, but for the most part there is good reason for it. When it comes to selling a home, marketing is a key factor and most Real Estate Agents have access to very powerful tools in this area. Visit with one or more realtors to get their opinion on the value of your home and what services they provide. Real Estate Attorney: This is not always necessary, but it can be an important asset. You must consider that a real estate agent is not a real estate attorney and they do not possess legal tools that may be necessary in the process of a home sale. In some situations an agent cannot provide valuable information or advice that an attorney can. Patience: Once the house goes on the market it is important to remain at peace with your decision to sell. Chances are you will encounter buyers who are not as in love with your home as you have been and their feedback could be received negatively. Try to remain objective when receiving feedback from potential buyers and take criticism of your home with a steady mind. If the house sells fast, great! If it remains on the market longer than you expected it can be difficult to keep a positive outlook on the process. This is why step one is SO important. Remember the goals you set for after the sale and know that it will happen in due time. Receiving Offers: Some offers can be frustratingly low, but others can be excitedly high. Nobody can tell you the honesty behind any offer, but carefully consider each one on its own merit. Once you make a decision to accept an offer, remain content that you made the right choice in the framework you had to choose from. Don’t Count Your Chickens: Once you have accepted an offer and all parties have signed a contract you may want to breathe a sigh of relief, but many home sellers would caution you that the deal is not done until it has officially closed. Buyers can be a fickle bunch and there are a variety of reasons they often pull out of a transaction before closing, even the very day before. It is just such a situation in which a good realtor and attorney can be good company. They can be your team in determining what it the best course of action if the good deal is going bad. Closing: You’ve done it, your house is sold! Celebrate all the hard work you put into the process and thank those who helped you along the way. Remember step 1? Put it in motion. Still no homestead news as we have yet to close on the sale of our city home. The deal we had in June ended with a terminated contract in July which you can read about in our previous post. It took some time to unravel the details of the contract termination, but we did finally get the house back on the market. About two weeks passed by and we ended up with several offers on the table. Yesterday we accepted what we think was the best of them and we again have a signed contract. I am hopeful this time we will go to closing, but due to the unforeseen drama of the previous contract we are throttling back our excitement. We haven’t been out to the homestead in over two months because we have been so busy putting this house sale together and making it ready for a buyer. We realize there isn’t much we could do out there in this Texas summer heat when we have no power or water, but we just love putting our eyes on the prize. Hopefully we will get out there again soon! I had hoped to have more news from the homestead this week as we had planned a weekend getaway to the property. Unfortunately we had to change plans due to the mold issue that came up last week in our home for sale. We examined the area of concern and found very little to actually be concerned about, then we turned around. As we examined the outer walls of the sunroom we did find some mold, not bad mind you, but it was there. The worst problem was not mold, but wood rot. Thankfully the structure is supported by the limestone walls because if it had been directed on the wooden frames, this thing would have surely collapsed. Knowing what we had to do, we sucked it up and went straight to work on the problem. We tore out all the existing wall framing, improved the design and rebuilt everything with pressure treated wood. We replaced regular sheetrock with greenboard to further protect against any future attempt by mold to gain a foothold in that room. Next step is the gutter, which unfortunately needs to be done by a licensed contractor. We could probably tackle it ourselves, but due to the severity of the issue we think it prudent to have someone who really knows gutters take care of this unique design challenge. We had to extend the closing date for the sale, but I am hopeful that this time it will actually happen. If it doesn’t it has not been due to a lack of effort on our part.